Whether your adventure calls for boats, trailers or even other vehicles, you'll appreciate how Sequoia's 7,400-lb. 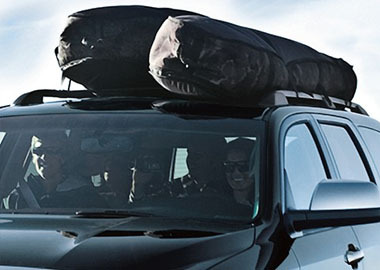 towing capacity makes it easy to bring them along for the ride. This available system can turn mountains into molehills. Just turn the shift dial to engage the 4WD mode and let the Torsen limited-slip center differential go to work. The differential can be locked to get maximum traction on slippery or uneven surfaces. Sequoia’s advanced Automatic Limited-Slip Differential (Auto LSD) uses the brakes to help reduce wheel spin, giving you enhanced traction performance on unpredictable road surfaces like sand or mud. 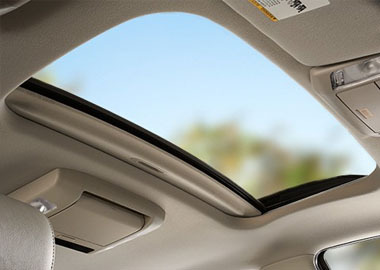 Take in more of the world with Sequoia's one-touch tilt/slide power moonroof with sliding sunshade. Imagine your passengers looking up and seeing the treetops of a tree-lined drive to the country, or a sky full of stars driving through a desert night. The moonroof doesn't just open up the cabin — it opens the entire experience. Sequoia offers back passengers the luxury of a Blu-ray Disc™ player to watch movies, making it the first production vehicle SUV in the world to offer high-definition rear-seat entertainment. On Platinum models, the rear-seat Blu-ray Disc™ entertainment system includes a 9-in. display and two wireless headphones. To make the going even more fun, this system has two RCA jacks, so passengers can plug in virtually any audio or video player they bring with them. Sequoia makes it easy to position yourself for any adventure. With one button, the Platinum and Limited models offer power reclining and fold-flat third-row seats that adjust to accommodate whomever or whatever you’d like them to you. Whether your adventure involves home improvement materials, camping gear or a new keyboard, with all the seats folded flat, Sequoia’s 120.1 cu. ft. cargo capacity behind the front seats is ready for it. And with the available power liftgate, you can access this space easier with just the press of a button on the key fob. You can close it the same way, too, or use a button inside the cargo area or on the dash. Thanks to an available integrated backup camera automatically displaying what the camera sees behind the vehicle when you shift into Reverse, Sequoia′s backup camera helps you avoid objects that might otherwise be out of view. If your adventure involves a long drive along remote highways or sparsely populated roads, you’ll be glad the Platinum is equipped with Dynamic Laser Cruise Control, which helps maintain a constant preset distance between you and the vehicle ahead based on driving lanes and vehicle speed.